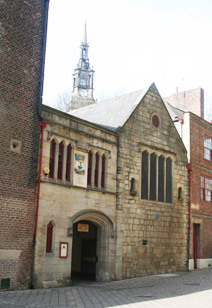 The Newcastle upon Tyne Trinity House is located on Broad Chare, just off the Quayside. If you are standing in front of the Law Courts, with your back to the river, Broad Chare runs to the left of that building, directly away from the Quayside. Approximately 100 metres up from the river, the road gives way to a paved pedestrian area. The archway leading into Trinity House is on the left, a few metres onto this part of the street, immediately past the Live Theatre’s Cafe Vivo. Click here to return to the top of the page. If travelling by car from the south, enter Newcastle on the A-167(M) northbound, travelling over the Tyne Bridge. Exit at the Pilgrim Street roundabout (sometimes referred to locally as the Swan House roundabout), immediately after crossing the river. Take the City Road A-186 exit, following signs for the Quayside. Approach the river front, passing the Law Courts on your right. Turn right immediately after the Law Courts buidling, into Broad Chare. You can drop off or pick up close to Trinity House in the vicinity of the Live Theatre, approximately 100 metres up from the river, but parking is not permitted directly outside Trinity House. If travelling by car from the north, enter Newcastle and follow the Central Motorway A-167 (M) southbound. Exit at the Pilgrim Street roundabout and take the City Road A-186 exit, following signs for the Quayside and continuing as above. Parking is heavily restricted in the streets around Trinity House, but there are two car parks close by. These are the Quayside multi-storey car park (postcode NE1 2AQ), located opposite the Trinity Gardens office building on Pandon Bank, behind the Law Courts and the basement car park underneath the Travelodge hotel (postcode NE1 2NH) on Forster Street. Both car parks are around 150 metres from the entrance to Trinity House. Click here to return to the top of the page. Many taxi drivers, even the local ones, are unaware of the Newcastle upon Tyne Trinity House and its location. If this proves to be the case, then it is recommended that you ask for the Live Theatre or give the Law Courts as a point of reference. Click here to return to the top of the page. Newcastle Central Station is a 20-minute walk, or a short taxi drive from the Quayside. The closest Metro stations are Central Station or Monument. Click here to access the Tyne & Wear Metro website. Click here to return to the top of the page. The Quayside is also served by the “Quay Link” bus service, which runs at regular intervals throughout the day and evening. The bus may be boarded outside the Theatre Royal (next to the Monument Metro station) or at the Haymarket bus station and the stop required is “the Law Courts”. Click here for a map and timetable. Click here to return to the top of the page. If you would like further assistance with directions, please feel free to contact us.